The Organization of American States (OAS) and the Spanish Agency for International Development Cooperation (AECID) today signed the agreement that makes the Spanish contribution of 2.2 million euros (about 2.5 million dollars) official, to finance projects executed by the OAS in the areas of human rights, legal development, crisis prevention and peace building and electoral systems. The Senior Advisor of the Strategic Council for Organizational Development and Management for Results of the OAS, Luis Porto, highlighted the central role that Spain plays in supporting the Organization's initiatives. 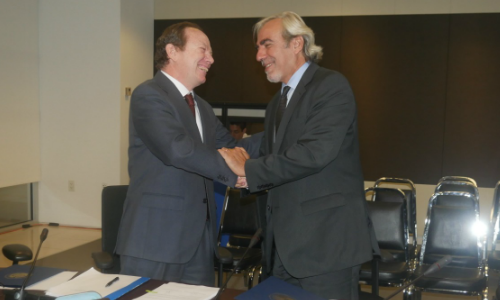 "The contribution of the AECID is crucial to finance several areas in which the OAS works, especially in emerging situations in which AECID has shown rapid response, thus leveraging the work of the General Secretariat," said Porto. For his part, the Permanent Observer of Spain to the OAS, Ambassador Cristóbal Valdés, highlighted his country's support for the Organization. "Spain is committed to the OAS, and we thank the General Secretariat for the work it carries out on joint projects," said Ambassador Valdés.